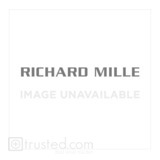 Richard Mille RM 014 Tourbillon Watch 514.48.91: This platinum watch with blue trim features manual winding tourbillon movement with hours, minutes, power reserve indicator, torque indicator and function selector. Also available in red gold, white gold and platinum. Inspired by the extraordinary sailing vessels of the yacht builders Perini Navi of Viareggio, Italy, the RM 014-1 echoes the visual elements and nautical details found on those famous craft. The shapes of the crown and the case outlines, the tourbillon and winding barrel bridges, the titanium screws of the case and movement, as well as many other elements are directly inspired by details found on the ocean going vessels created by Perini Navi. The RM 014-1 marks an exceptional premiere of oceanic themes within the collection of Richard Mille Watches. MARINE CALIBER RM 014: Manual winding tourbillon movement with hours, minutes, power reserve indicator, torque indicator and function selector. A composite material of carbon nanofibers that becomes an isotrope possessing mechanical, physical and chemical stability when molded under high pressure. This carbon composite structure is also amorphous, chemically neutral and dimensionally stable within a wide range of temperatures. Shows the mainspring tension and enables the movement timing to be optimized. Below 53 dNmm, the spring is too slack; at the other extreme, above 65 dNmm, excessive tension can adversely affect the running of the movement and may even cause damage. (These indications are shown on the numeric scale positioned between 2 and 4 o’clock). In a manner similar to a car's gearbox, a push-button located at the center of the crown allows one to select the winding, neutral and hand setting functions with a simple push. A hand near 4 o’clock displays the selected function: C-(Carica) winding, N-(Neutrale) neutral, L-(Lancette) hand setting. This development is part of a coherent and logical philosophy regarding longevity and the mechanical maintenance of ultra-high quality wristwatches and machines. The ribs ensure better rigidity for the bottom plate/bridge assembly.